I've recently been gifted a pair of identical cheap plastic gun bodies which others bought and decided weren't worth converting to Lasertag. Being super cheap I decided I would anyway. With a ton of projects already behind this was definitely going to be something to tackle once I'd caught up. Except I couldn't control myself and did one of them this evening. Once opened up there's a basic spring metal trigger switch and nasty looking but quite decent sounding loud sound/light board with fair sized speaker. It's so cheap and nasty it uses a little incandescent bulb instead of an LED for the muzzle flash. A little look at the wiring confirmed the sound board has a power supply and separate connection that you take high to trigger it. Perfect for driving from a microcontroller. When you pull the trigger it also drives a motor with offset weight on the spindle to cause vibration but I decided to junk this. The battery holder is easily accessible and takes three AA batteries. With alkaline batteries in this gets you 4.5V or more and connected up to the 5V side of an Arduino Nano, rather than the Vin this drives one just fine. Adding a recharge socket and rechargeable batteries is faff I can't be bothered with in a cheap fun gun. There's also a button on the side, which in one of the guns activates a crummy laser pointer so you can do the red dot thing beloved of 80s action movies. The switch is still there in this gun despite it not having the laser and it makes a perfect reload button. I couldn't be bothered to make up a lens assembly for these so I stuck an IR emitter in a metal holder and hot-glued it where the laser was supposed to emerge. I've put a plug/socket arrangement in case I decide to go back and fit a proper emitter. Unlensed the range is going to be poor, but I want them for a bit of fun in the Judge Dredd and Fallout based games that are being run at Dropzone next month. With these post-Apocalyptic themes I want to have one in each hand firing wildly, shouting obscenities in a kind of cinematic manner. Bothering about being seriously effective in Lasertag games is for other people, I mostly want to have fun. Sometimes that means being effective, sometimes that means dying in a silly way and I want some silly at Dropzone. The only real mod I had to make to the case was to Dremel out a hole for an on/off switch in the side. Then it was wire it up to the Nano, hack some code around and it worked straight away. 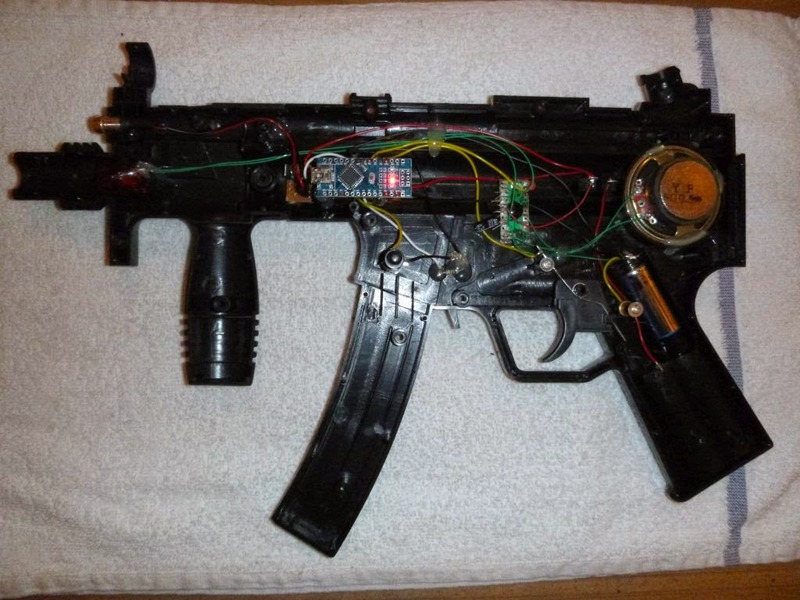 With no sound board to send serial commands to or different fire modes it's massively simpler than my Skorpion pistol, which being my first Tag gun took me days on end to build. OK, right now this is single shot with no ammo count but that'll take no time to sort out. Once I've completed the code I'll convert the second body. This has a snapped off foregrip so it'll need some kind of bodgy repair. This may just be a case of filing down the sharp edges and smothering it in gaffa tape. Something I may try in this code is to make it an 'instant on' gun. Most guns have a start up delay to stop you just turning them off/on to reload or reset the number of magazines available, which would be a bit cheaty as both have an enforced delay. This startup delay seems to take forever and can be very annoying if you've forgotten to switch it on or just want to test a sensor. As the Arduino has EEPROM built in, it should be trivial to make it record the current shot and magazine count every time it changes. So you can turn it off/on and then it'll just carry on where you left off. It'll then need some kind of button combo to tell it to reset, this could be as simple as holding down reload while switching it on, at which point you get the long startup sequence. Or something like that. Really, the long startup sounds trivial but it is a pain in the arse and it's one of the things tagger moan about, so experimenting with alternatives seems like something to do. 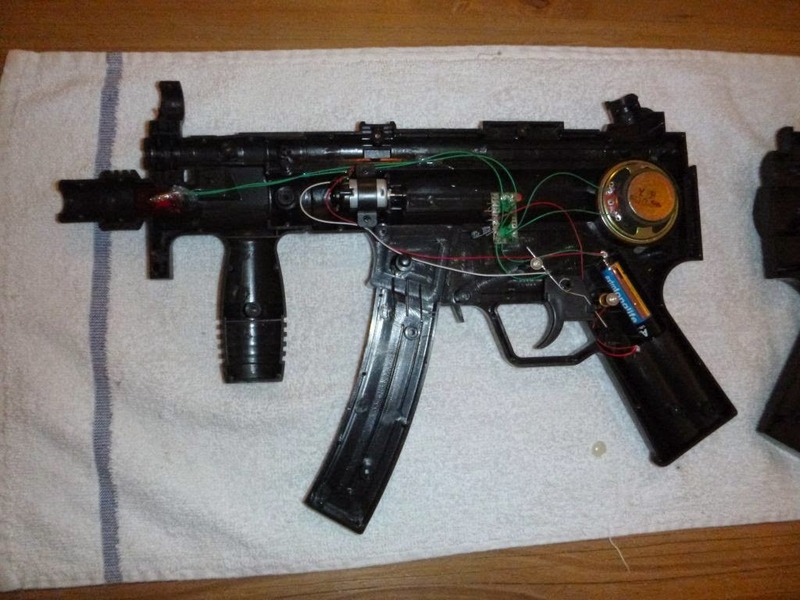 If it works well I'll add it to the Skorpion.